This is the magic they call technology that sitting here in a bus while reminiscing about my very first train journey, I am writing this post. I had travelled by train for the first time almost a decade ago. Well not really, because I have been on a train even before that but I was so young that those memories are fuzzy. “Train travels are fun, fun, fun; when made under the sun. If that not be the case and one has to travel thirteen hours, majority of which are hours of darkness, then it is an absolutely different experience . Pity I never knew this before the train started moving. When I say it is a different experience, I do not mean that it’s a bad one. Let’s just say a writer would enjoy the day journey and a poet would love the night. Since this was the first time I was inside a train, I was too excited to retch over the malodour from the ‘latrine’ or the dirty curtains or the paan stains in the corners. My lips were zipped and my head would have done a 360 if it was possible. Thrilled to the core, I looked around at everyone, making mental notes of their actions, looks and strange (in some cases disgusting) behaviours. Some of these people smiled back at me while others glared, muttered something and looked away. Half an hour later the excitement started waning and it was completely smothered when a child in the neighbouring berth started crying so shrilly it hurt my ears. I would have understood if he would have been anywhere up to five years old but he must have been around twelve and I had to stifle the urge to ask him to shut up. All this reminded me of a friend who would never endure such things and the thought of her face in the exact situation made me smile. Power of friendship! At about 10.30 p.m. people began climbing their berths and started switching off the lights. I have never been able to sleep before one a.m. so I took aid of a dim light to read the book I had brought along. Around midnight, I turned for a ‘good-night’s-sleep’. But, alas! I have no problem climbing up to my berth but then I notice the six feet difference between me and the floor. Already resentful at having to give up the window, I look down and my stomach starts rumbling as the phobia creeps in. Somehow I lie down, shut my eyes and try sleeping. But the constant joggling hampers any kind of sleep. So with some hope and much understanding of the fact that I still have ten good dead hours of the night to pass, I stuff the earplugs into my ears. After what seemed like eternity I checked my watch just to be shocked that only an hour and a little more had passed. Cussing under my breath, I blame my frigging self for insisting on this many wheeled transport. In my defence, train travels had always been described so amazingly in books! Finding no respite, I leapt down and sat by my slumbering mumma’s head and watched out of the window. The view was superb. Nope…actually there wasn’t much of a ‘view’. 😦 Just darkness and what I thought were trees. I move and with me moves everything. For no particular reason I peep at the sky and hold my breath at the beauty of it. Has it always been like this? The moon was its yellowish colour (which I prefer to its usual white shade). 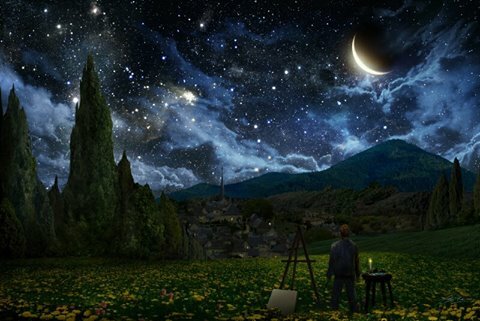 The stars twinkled as if smiling and the clouds all had a mystical touch to them. For some reason, I was comforted by this sight and felt immensely peaceful. I spent a long time watching the sky and thinking of nothing in particular. Then the train started to slow down at Guntakal station. Brightness filled the train. Here I was in for a shock. It was four a.m. and people were sprawled asleep on the floor. Some of these were in rags, obviously beggars but some of them were passengers. When the train started moving again I rested my head on the window sill and let the wind slap my face. I thought of a thousand things then. Being able to hold your loved ones whenever you want, is a lucky luxury. My head was soon filled with croaky shouts of ‘idly-wada’ and ‘chai garam’ and a lot of common buzzing. Chai garam was nothing like chai. I missed my green tea. But the morning sun and the green fields that met my eyes made up for everything. The kid who was crying the previous night seemed very happy stuffing idly into his mouth. The couple was gone and in their place were a group of young men who I guessed by the uniform were students. P.S I have travelled by many trains many times after that but that journey and that couple will always have a special place in my heart. Categories: Uncategorized | Tags: couple, green tea, India, journey, love, memories, moon, photo, plane, sky, stars., story, train, train journey, travelling, travels, trees, window | Permalink. 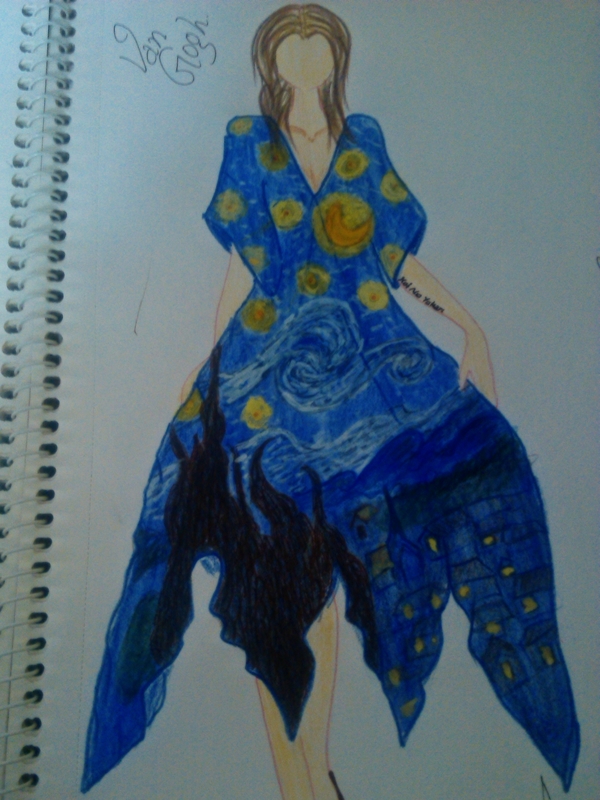 Categories: Illustrations | Tags: art, drawing, fashion, illustration, starry night, stars., Van Gogh | Permalink. Along with the pleasant sight, comes a sweet pain. I bade my heart build poor rhymes. Ah, lost love will always be haunting. It has come to wash away your fears! Categories: Nutty me, Poesy | Tags: art, delight, life, love, moon, muse, night, night time, poem, Poetry, rain, stars., wind | Permalink. In the dark there was a Rainbow. Categories: Poesy | Tags: before falling into dreams, night time, Rainbow, stars. | Permalink.